Hi all! So to help both you and I amidst a pretty crazy week, I am pulling a few of the cooking club favorites, so we can make recipes we are somewhat familiar with, instead of doing new things. If you are new (hi!) and haven’t tried these yet, hope you enjoy! These are some member favorites from the past 16 weeks of cooking dinners together. Please do join the Facebook group if you haven’t already. People are sharing swaps they made and asking questions and it’s what I am hoping more of us can do to build the community here. If you consider yourself a beginner cook, please please don’t hesitate to ask questions, be it there or in a DM. I desire for you to feel confident in getting dinner on the table. I made too many different batches of cinnamon rolls the past few weeks looking for just the right recipe. Our tastes may vary, but I really liked the texture of these. All the dough recipes vary slightly by ratios of egg, sugar, butter, flour and these were the favorites of all the recipes I tried. It is a riff on the Cinnabon version, and I toned down the butter an sugar just a bit. I made notes within the recipe for you to have them on Christmas morning if you need a breakfast treat. They are decadent as I don’t find a sweet roll worth the trouble otherwise. 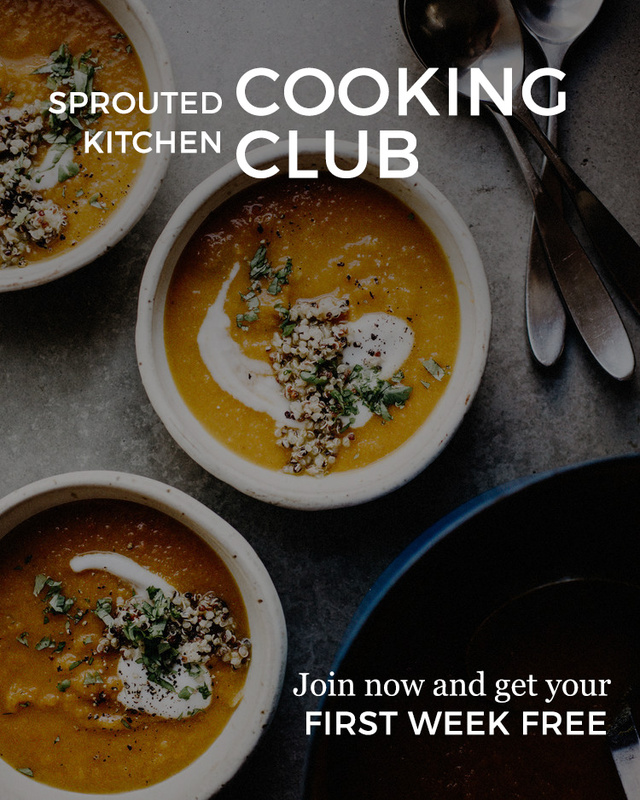 - For you last minute shoppers Cooking Club gift memberships are available in The Shop. Look at us making a vegan soup! I have a tough time with pureed soups, as they mimic all the baby food I have made in years past, so I like to add texturey bits on top. Here, I used leftover quinoa and garbanzos, which I had some of frozen from the eggplant dish two weeks ago. A scoop of rice to fill it out would be nice too. I added other suggestions below. I only put the quinoa, yogurt and cilantro on the grocery list, the remaining garnish suggestions are NOT on the grocery list, so if these are items you do not stock, or have leftover from previous weeks, be sure to add them! make ahead: the entire soup can be made 3-5 days in advance, and kept covered in the fridge. use it twice: double and freeze! My aunt taught me the best way to freeze soup was in a gallon ziplock. Lay it flat, push out the extra air before sealing, and then it stores flat in the freezer to take up minimal space. kid friendly: be sure your curry powder isn’t too spicy. Serve the soup with avocado toast or pita breads on the side for dipping, depending on your garnishes. In a large dutch oven over medium heat, warm the oil. Add the onion, potato, carrots, garlic and a few pinches of sea salt. Cook, stirring occasionally, for about 7-8 minutes until starting to soften and color on the edges. Add the broth and curry powder, bring the broth to a gentle simmer, leave the cover ajar and cook for 20 minutes for the vegetables to soften. Turn the heat off. Stir in the ginger and coconut milk and let it cool down. Serve the soup warm with your choice of garnishes. This makes a lot of risotto. If you are one of the folks feeding 2-ish adults, I would halve this for sure. Otherwise, invite people over! Or it’s great for the holiday dinner. It also reheats beautifully and can also be frozen, and reheated for a later time. make ahead: chop your onions and squash. Make the candied walnuts up to 5 days in advance. use it twice: reheat any leftovers with a splash of water or broth to loosen. I love some leftover risotto with a fried egg on top. dairy free: use a dairy-free butter alternative. Olive oil would also be fine. Top with some panko breadcrumbs, that have been just toasted in a drizzle of olive oil and salt to sprinkle on the top to make up for the lack of cheese. Put this on just before that last broil. Place the walnuts, sugar, and rosemary leaves in a dry skillet over medium heat. Stir occasionally as the sugar melts and caramelizes. Don’t leave the pan, as the walnuts and sugar can burn quickly. As the sugar starts to melt, stir continuously until completely melted and the walnuts shift in color. They may smoke a bit. Immediately dump the nuts onto a plate or piece of parchment and sprinkle with salt. Let cool. Heat 2 Tbsp. of the butter in a large skillet. Stir in the onion and rosemary and saute over medium heat until they just start to color, about 10 minutes. Add the butternut squash, 1/2 tsp. of the salt and cook for another 5 minutes. In a 13x9” baking dish (or similar size, a 12” cast iron skillet worked great for me), combine the rice, stock, 1/2 cup of the wine, remaining 2 Tbsp. butter and remaining 1/2 tsp. salt. Stir in the butternut squash mixture. Place the dish on the middle rack of a cold oven. Turn the temperature to 400’. Bake for 30 minutes, stirring half-way through. The rice should be slightly chewy. Remove the baking dish from the oven, then stir in the remaining 1/2 cup white wine and parmesan. Turn the heat to broil and give the top a little toast, just for a few minutes. While the risotto bakes, make your walnuts if you haven’t done so in advance. Serve the risotto with a sprinkle of fresh parsley, rosemary and the candied walnuts on top! Adapted from a Cinnabon riff from my friend Tori. I know what you’re thinking, that’s a lot of cinnamon rolls, and it is. You can actually halve this recipe with success, or you make the full recipe, divide the assembled rolls between two pans and pass one of the pans to a friend who can bake them off the next morning so they are fresh and warm. What a gift! They can also be frozen and saved for another occasion. Make Ahead: you can prep the rolls a day in advance, up to the point where you have them arranged in the baking dish(es). Leave them covered in the fridge. Whomever wakes up first in the morning, should pull them from the fridge so they can rest and rise for at least one hour before baking. The frosting can also be prepared in advance and pulled out to room temperature. Warm the milk (not super hot, just above body temp.). Stir in the yeast and let it sit for a few minutes to dissolve. Add the eggs, whisk them in well. Stir in the butter, salt and sugar to combine. Add 4 1/4 cups of the flour, reserve the rest for rolling them out. Stir everything together to combine, then dump the dough on a lightly floured surface. Knead the dough by pushing it with the heels of your hands and pulling it back to you on repeat for about 5 minutes. Roll it into a smooth little dough baby, cover it with a dish towel or plastic wrap and let it rise until it doubles in size. This time of year, since it’s a little chillier, this will take no less than an hour, likely two. Go do something else and just leave it alone. While you’re waiting, stir the brown sugar, cinnamon and butter together. It should look like a thick paste. Roll the dough out into a 1/4” thick rectangle. No need to bust out a ruler, just guess. Spread the brown sugar butter mixture all across the top. Sprinkle pecan or walnut pieces in there if you like nuts. Starting with the long side, roll the dough down into a log. Cut the log into 14 pieces (you can make them smaller or larger to your preference). Arrange them with an inch of space between in one or two greased baking dishes. I don’t need 14 rolls for just my family, so I bake half in a 10” cast iron skillet and put the rest in a second baking dish to gift). Cover the rolls loosely and let them rise another hour. Preheat the oven to 350’. Bake the rolls on the middle rack for 18-20 minutes. I like mine a little underdone, so we go with 18. 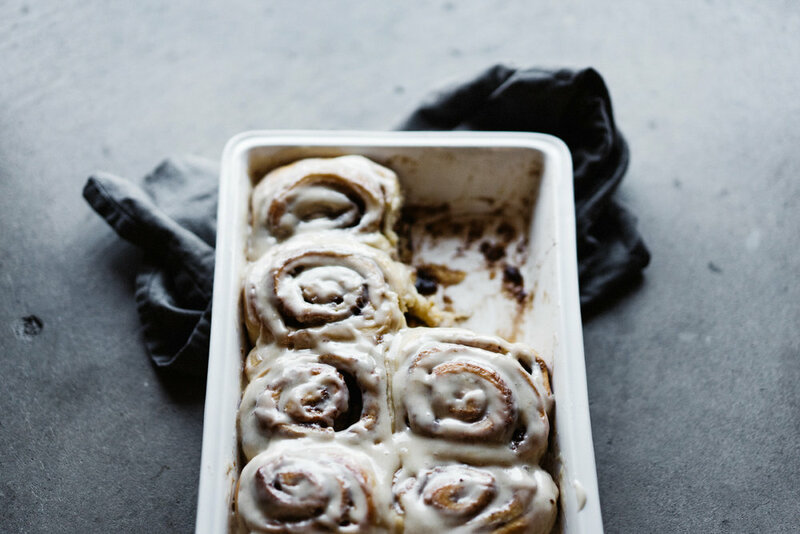 While the rolls bake, whip up your frosting. In a stand mixer or with an electric mixer (or by hand with your strong muscles), mix the cream cheese and butter together until well combined and smooth (about 5 minutes in a stand mixer). Add the maple, powdered sugar, vanilla and pinch of salt and mix again. While the rolls are still warm, spread the frosting across the top and let it drip into the crannies. Enjoy warm.